Please feel free to download and share our material! 1. Let’s start working together! 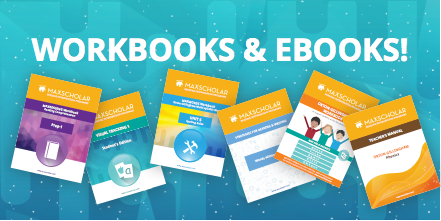 Once your school has decided to implement MaxScholar in the classroom, you will receive an email with materials to prepare for the training. These materials include teaching resources, informational documents, and a list in order to generate accounts for students and teachers. Our team will go to your school in order to train the teachers that will be implementing the software. We will go through all the steps of the different programs, games, and apps. This is when you will receive all the usernames and passwords and will be able to practice using the software and all of its components. Our team will schedule complimentary follow-up visits to your school in order to ensure fidelity and proper implementation. This will guarantee your students get the best possible results out of the MaxScholar learning experience. You can always contact our customer service team with any questions, issues, or recommendations. We are available on the phone, via email, or videoconference to provide quick and effective service that will help the implementation process. We are continuously developing printable resources that can be used by educators to enhance the effectiveness of our programs, games, and apps. These materials are based on experience and feedback of our biggest collaborators: schools, teachers, and students.